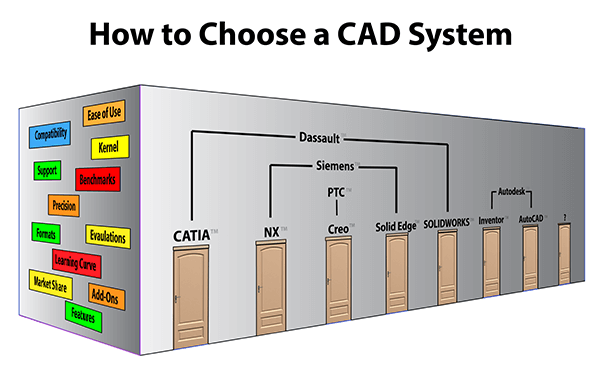 Engineering.com recently circulated the article ‘How to choose a CAD system’, penned by L. Stephen Wolfe, who was the primary force behind The CAD Report for over 20 years (The CAD Report was ‘the’ CAD resource during the 90’s that commented on the state of the MCAD industry and pulled no punches). This article offers advice for buying a CAD system. You can access a version of this article via Engineering.com, and you can also find a copy at solidworks.com here. Stephen’s advice is definitely sound, but since it appears to be a dated article (the paper refers to Stephen’s ‘new’ venture, CADCAMNET.com, which was sold in 2004 and is now vacant), I thought I would summarize his paper while mentioning some factors that have changed in the last twelve years, and point out additional areas a prospective CAD buyer might want to consider. This will be a multi-part article. Stephen’s original topics are listed below. Links to related articles will be added as they are developed. Number one on Stephen’s list is to look for a CAD system that has capable, efficient 3D design. Stephen stresses that companies should include their own parts as criteria when evaluating CAD systems. He makes the point that when evaluating, if one CAD system can do the job in 20 less steps than another, this could end up being a huge cost advantage. This is timeless advice; companies who prove out that the prospective CAD system can handle all of their design and engineering needs efficiently have gone a long way towards guaranteeing the viability of their choice for years to come. We’ve all heard stories of software decisions that are made without regard to the how well the solution actually fits the task at hand. I remember sitting in on a demo of Pro Engineer (which became Creo in 2010) back in the 90’s. In those days, Pro/E had a strong market position as a fast, capable, dimension-driven CAD system. At one point, the engineer doing the demonstration was asked by an audience member “What did you do just now?” to which the demo jock replied “I just did seven things”. Pro/E demo jocks were notoriously fast with menu clicks and the software was so powerful at creating almost any kind of geometry that it sometimes looked easier to use than it really was. Smart companies consider not only if the system can model their geometry, but how much training is involved and how easily that geometry can be created in different CAD solutions. Stephen does not cover the process of assessing a CAD system so I’d summarize it to include assessing via demo, via benchmark and via evaluation. Personally, I’d always recommend an evaluation period so that you and your designers, estimators and engineers know what they’re getting before it’s too late. MCAD resellers for every major CAD system can be found in every major city, and are usually glad to do a standard demo, or a more personalized demo, either at their office or at your office, as a means of making the sale. It may be that the standard demo covers the needs your firm has perfectly, but more likely you will want to give them a part or assembly to model, or ask them to choose a demo that is similar to something you already produce. One way to quickly get to the bottom of what a CAD system can do with your data is to ask for a competitive benchmark. One benchmark that comes to mind involved myself and another application engineer spending 18 hours in a hotel room using Inventor to model parts and assemblies from information on fifty D-size prints we’d taped to the walls. The next day we were sequestered from each other and told to make changes to the geometry, and react to changes the other AE had made. Over the next week, two other CAD vendors attempted the same process, and the data gathered during this study helped the company decide on which system to purchase. The benefit of competitive benchmarks is that you get to throw specific challenging scenarios at skilled application engineers to see if they can come up with a viable solution, sparing your engineering and design teams the time investment of learning the application software; on the other hand, if your team is not intimately familiar with the software you may miss nuances that are important in the decision-making process. More typically, key users within the organization are provided with an evaluation version of the CAD software for at least a few days so that they can test it against their own models and processes in order to assess viability. Most CAD vendors offer an evaluation period; it’s up to you as the prospect to negotiate with the vendor or reseller for enough evaluation time to clearly ascertain whether the solution will work for you. At the time of this writing, TransMagic provides prospective users access to a fully functional version of SuperView for 7 days; evaluations of Pro or Expert for longer time periods are available by contacting our office. Please stay tuned for more to come on this subject. As always, if you have any questions or comments, send them to social@TransMagic.com.